CUSAT Admit card 2018 is available to download from 17 April 2018. The candidates who have applied for CUSAT can download CUSAT Admit Card 2018 from the link given on this page. It is to be noted that CUSAT Admit Card will NOT be sent by post or e-mail. 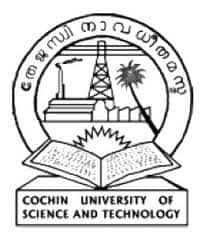 The admit card for CUSAT is the required document for admission to Cochin University of Science and Technology. Admit card for CUSAT exam is in online mode. Students are required to keep their CUSAT Admit Card carefully. The Admit card will be needed for presenting in the CUSAT CAT Exam Centre and also at the time of admission. CUSAT CAT 2018 will be conducted in computer-based mode. Until last year, the exam was held in Pen and Paper based mode. CUSAT Admit Card is released on 17 April 2018. To download the admit card, candidates are required to enter their Registration Number and Date of Birth in the required space. Click on CUSAT Admit Card link given above. On the login page, enter CUSAT registration number and date of birth. Check details on the admit card, download a copy as well as take a print out. At the time of verification of the CUSAT admit card, if the candidate finds any discrepancy then they should immediately report it to the exam conducting authority. Candidates can take a printout of the CUSAT Admit Card and keep it carefully for future use. CUSAT CAT 2018 test paper will comprise of 250 objective type multiple choice questions based on Class 12 syllabus. Maximum marks will be 750. Minimum of ten marks for Mathematics. Minimum 10 marks for Physics and Chemistry put together to be eligible to figure in the respective rank list. Candidates can check here the CUSAT CAT 2018 Result. If candidates have any query related to CUSAT CAT Admit Card, they can write in the comments section below.